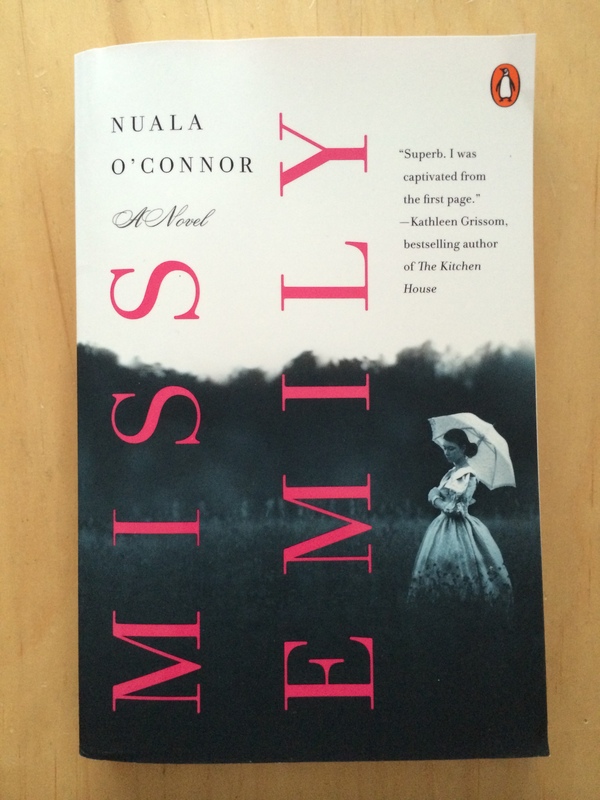 Nuala O’Connor’s Miss Emily* is an upstairs/downstairs novel about Emily Dickinson and an imagined Irish maid-of-all-work. While it is Ms. O’Connor’s first novel published in the United States, she has published two novels, short stories, and poetry in the U.K. and Ireland, where she often writes under the name Nuala Ní Chonchúir. Miss Emily takes place over the course of a year or so, when 18-year-old Ada Concannon leaves Ireland for America, where she finds work in Amherst with the odd but locally esteemed Dickinson family. Chapters alternate between Ada’s voice and that of Emily Dickinson, who in her mid-30s is headed toward the seclusion she’s well known for. Despite the gaps in age, class, education, and origins, Ada and Emily form a friendship, trading recipes and observations about goings-on in the natural world. The novel’s strongest aspects include its descriptions, particularly Ada’s recollections of Dublin and her grandmother’s cottage, and Ms. O’Connor’s rendering of Emily’s facility with language and adept way with peculiar images. Readers fond of realistic renderings of everyday life in historical fiction will find much to please them here. Miss Emily moves very fast, thanks to its short chapters that change perspective, but I would have preferred a longer version with more expansion on the Dickinson family’s relationships and those within Ada’s family. Readers conversant with Emily Dickinson’s biography will pick up on the family dynamics, but those who don’t know much about the poet may find themselves lost at times. Without giving too much away, I’d also add that I found the novel’s ending disappointing, shifting agency away from the main characters we’ve spent so much time with in favor of male characters who aren’t as fully drawn. In the last quarter of the novel, Emily and Ada react to events, rather than choosing their own paths, which is unfortunate and not in keeping with the tone of the novel’s first half. Despite these issues, I’d still recommend Miss Emily for a quick summer read, and I’d be happy to read more of Ms. O’Connor’s writing, particularly her poetry. And I suspect that after you read this book, you’ll be curious to see, as I am, the Homestead, the Dickinson family home. I’ve lived about two hours from it for years, and I’m sorry to say I haven’t been to see it—but I hope to get out to Amherst later this summer, Emily Dickinson’s own words in hand. You can read more about Nuala O’Connor here. And if you’re interested in visiting the Emily Dickinson Museum, you can read more about it here. Hadn’t heard of this book or author. From your description, I wonder if the style might be a bit similar to Maeve Binchy? Sounds like it’s worthy of a read! Thanks for sharing! I just read this on my camping trip, and really liked it. Although, I agree that it could have been longer with more to Emily’s side of the story. But, wanting it to have been longer is a good sign that I was enjoying it! I did end up googling Emily Dickinson to find out more about her and her family. I don’t know what to think of the end – only that I was sad it had to end the way it did. I was hoping they could turn things around somehow. I was also concerned enough about Ada’s health that I had to look up the side effects of mercury. I only knew them because of Out of Africa. I’ve been seeing books by Nuala O’Connor around online and wondering if I should try them. This one sounds promising. It’s also very fast, so it’s not a huge investment in time. I’m really interested to see what her work set in Ireland is like. The only other novel I’ve read that had Emily Dickinson as a character was very disappointing. I think the novels set in Ireland are the ones I’ve read about before. I like the sound of this very much, but I am a little tired of meeting real authors as fictional characters. I’d much rather contemporary authors took inspiration and made bigger leaps of imagination. But that doesn’t mean that I won’t pick this book up when I see a copy …. Great review, I think I will add this to my list. Thanks Carolyn!